Obituary. Died, on the 28th of January, 1823, at the Cherokee agency, aged LXXXIII, Colonel Return Jonathan Meigs. 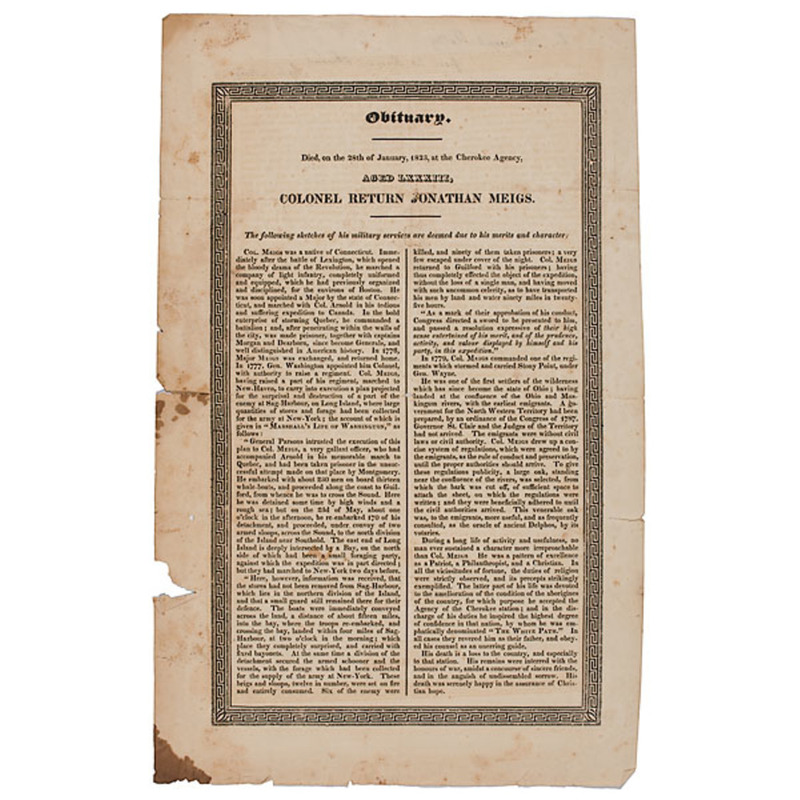 Printed broadside, 10 x 16 in., bearing the obituary of Return J. Meigs, Sr. (1740-1823), a Revolutionary War officer, Indian agent, and settler of the Northwest Territory. N.d., ca 1823. Two columns of text provide a brief biography of Meigs, with special attention paid to his storied military career. Enclosed by stylized Greek key border, with inscription on verso reading, "For W. Joseph Kelley - / from his Sincere Friend / Sophia Meigs." Sophia Wright Meigs (1768-1825) was the daughter-in-law of Colonel Meigs, having married his son Return J. Meigs (1764-1825), US Senator and fourth Governor of Ohio, in 1788. A scarce early broadside; OCLC shows only the examples held at N.Y. Historical Society, Connecticut Historical Society, and Lilly Library. Brittleness, foxing, and staining, particularly at lower left corner. Several small tears to edges and some areas of slight loss.